Well, the SX Video Design Challenge and Contest went so well that Ubicom (Scenix) kicked in 20 Ethernet SX Stack Evaluation Kits as prizes for the next contest! The (minimal) hardware for the Modem Physical Layer is NOT on these boards, but I've included the figures incase you want to plan for that in the long run. 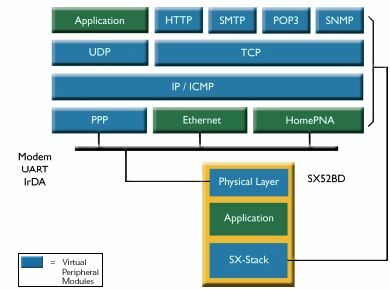 ...you need to pic one of the SX Stack Layers and then add that to whatever Physical Layer parts you want and subtract that from the 4k words and 262 bytes of RAM the SX52 provides to find out how much room you have for your application idea. An intranet intercom or phone unit that uses existing network cabling to avoid additional wire runs / switching equipment. Forget compression, its on an intrA net. Or squeeze in some ADPCM compression. In a big, industrial building, the cost of the wire runs or the extra phone switch could easily pay for the development and production of a little box with and SX and Ethernet adapter, a mic, a speaker, some op amps and a keypad. Multi FAX to net adapters. Each one plugs into a phone line and answers FAX calls, then streams the data over the net to a common server that stores and serves the images. Much cheaper than the currently available multi-line fax boards and can be positioned where ever the phone lines are now rather than requiring a central connection point. RFID or IRDA network adapters. Anywhere that you need to track where things are that move around in your building (or what room your cat is hiding in 2 minutes before the vet appointment..) you can tag them with RF or IR xmitters and place one SX/Ethernet board with a receiver and ID decoder in each room to report what it sees back to a PC via UDP. Given two way IR or RF connections, this could be extended to provide wireless network support with each device acting as a "cellular network transceiver" for its office space. ...besides any number of industrial control or reporting solutions where you need a network connection and some signal conditioning or processing and intelligence in the interface. Now to MAR: By the end of Feb, you need to have emailed or posted your contest idea. No code required, just a write up of what and why. These will be posted and discussed. I'll give some feed back on how likely your idea is to be doable and a winner. All the ideas will be posted on the site with full credit to the author. Also, keep in mind that the first person to register an idea owns it for the purposes of this contest. You can't enter an idea that someone else has already entered. So post your plan NOW! MAR to APR: Next comes the actual code. Remember: this is for an SX52. More code, more registers. A few tricks. But I'm not going to require that you have one now. Put in dummy SX-Stack API calls (all just retp's) and write the code in an SX 28 , a PIC or even a simulator. I will try to get some SX52 chips for people who want them and don't have them (the current distributors are targeting big volumes only for this powerful chip) and we will discuss programming and debugging the monster. By the end of March, you need to have emailed or posted some code. Doesn't have to be working, but it has to be complete and look reasonable; needing only porting to the SX52 and debugging. APR to MAY: At the start of this phase, I will mail out the 20 Ethernet SX Stack Evaluation Kits to the best entries so you can actually implement your design. This final part of the contest is a race... the first finalist to post working code wins the contest and is declared the SX Master (or Mistress) on the site, receives a trophy and some toys and a $100 cash (check) award. These things are $200 a pop. The source and design must use an SX and be GPL'd. The contest will run from now until the end of May 2001 in three phases: Deadline for entry: March 1st, 2001. Deadline for code: April 2nd, 2001. Deadline for finished entry: May 1st, 2001. About 2.5 months. So send in what you have even if it's not perfect. drawing text on the tv (the caller id info, or whatever is sent to the proper UDP port. remote controlling the various A/V equipment with commands sent via the ethernet. A daemon on one of the computers on the network would normally control the device but the device may include some automatic things, like turn the TV on and show callerid info automatically and then turn the tv off if it was off previously. I would eventually include an IR receiver to remote control some other things through the network. this is about 2k, and about 130 registers. For my contest entry I will be designing a kitchen internet appliance. It will download recipes from any computer on the intranet and maybe even the internet. When any food is need it can be typed or entered on the touch screen so it can compile a shopping lists of what is needed. It will probably (why not?) have games, and if I have time maybe even two multi-player with someone on the computer. I think I might use an LCD controller IC or an SX to scan the LCD and run touch screen. Until I have the screen taken care of I will write a QBASIC program to interface through the printer port and emulate the screen. I will probably implement either POP3 or HTTP to get recipes, and fill in what features I can until I run out of room. I propose using the SX Stack EVALUATION BOARD to form an interface transducer between an automobile (Truck or Car) computer system, (both OBD-I and OBD-II) and the internet. This would allow for remote acquisition of data, (in the form of error codes or sensor readings), regarding the condition of the vehicle in question. This could be utilized by auto dealerships, auto repair garages, trucking or delivery fleet services, etc. Benefits include being able to do a diagnosis of the vehicle in question and then taking the correct parts with you on a field repair, having another expert look at the symptoms of a vehicles condition to correctly diagnose a problem with which the current technician is unfamiliar, keeping a running tab on the condition of a given vehicle even as the vehicle is on the road, etc. And with GPS, the location of the vehicle could be ascertained. While I was looking at the plants in my room, I came up with this idea. I noticed that my 2 trees were dying. I wanted to make a monitoring system to keep them watered and at a good temperature. This system would be computer controlled through a Visual Basic program that I will write. I could also use this to control my heat with a servo motor connected to the valve. This will all be checked and automatically adjusted. Long term collection and presentation of environmental data currently requires large and expensive personal computers and networking hardware. This equipment is used for Weather Prediction, Home/Office HVAC monitoring, Factory Floor and Warehouse materials monitoring, Agricultural data collection, and Biological and Environmental Research. The currently available equipment is cumbersome, expensive, and difficult to protect from harsh environments or theft in remote areas. The size of the equipment, and the heat radiated from such units also tends to impact the environment being monitored. This is especially true of micro biosphere type experiments. Data collection in remote areas also posses accessibility and operator hazard problems. The ideal system should be accessible from multiple physical locations, by multiple users, and present the data in a easily interpretable format. Create an Ethernet connected device which can collect, store, and present environmental data over the Internet or intranet. The device should be compact and low power, being enclosed in a NEMA type enclosure. Data should be presented as a simple HTML page via HTTP protocols, as well as comma separated values for remote archival and programmatic interpretation. The device should be able to function as a remote weather station, ans well as a scientific environmental data collection device. Low speed image capture via digital CCD camera. WINNER Andrew G Miller [andrew.g.miller at attbi.com] says: I'd like to make a second entry. The SX device will maintain accumulated state information on a particular X10 house code, and will provide HTML pages for a GUI [Ed: fits in less than 15k!]. The HTML GUI can be used to interrogate the status of the X10 modules, and switch X10 devices on/off/dim from the internet. I might even program some X10 macros. Given the current Napster brouhaha, people may soon be looking for new ways to exchange files via the net. My proposal is to create a standalone "net storage device" to which users can log in and upload/download files. The SX52 has abundant I/O and would serve as an excellent platform on which to develop an IDE hard drive interface. Add the SX-Ethernet Stack, a little code integration and you have all the pieces for the net storage device. Create a minimal parts-count IDE drive interface. Create a second Embedded Ethernet device that pulls MP3 files from the SX Net Storage Device and plays them in realtime. Essentially, a 'Net Jukebox'. Interface a serial WebCam (a'la Atmel Barbiecam and similar projects). Store images on hard drive for later scanning and retrieval. Add-on: Write some simple camera motion-detector software. Interface a Mic, preamp, A/D and you can record hours of audio for later download and review. 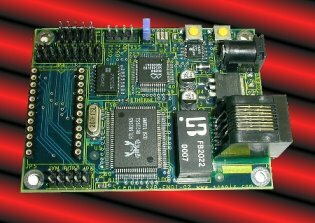 Create separate SX-28 A/D D/A boards with UDP interface and create a "voice mail" system. Each remote stores audio on the server and downloads messages. Add Sensory's speech recognition device and it can be voice activated. Add multiple drive support for a poor-man's 'Net RAID Controller'? Replace IDE hard drive with CD-ROM, implement ATAPI controls, create network controlled music system. Hi, I'd like to see something like the "Stamp Drive" produced by MSV; in which any serial device with a terminal program can access a (FAT32 formatted) CompactFlash card, uploading and downloading files from it - that way I can attach a "hard drive" serially to my... Vic-20, Epson PX-8, ZX-81, etc. and backup all my tape based software. Of course full IDE support would be appreciated. I'd even be willing to put up a $100us "cash prise". My idea is simple: the Furby/ethernet router. Provide a socket-based interface for communicating with one or more Furbies over a network. Use one of the serial ports and additional IR circuitry to send/receive commands to Furbie from any computer on network. Each Furby will be given an IP address (using DHCP?). A Furby command set will be defined. I'll attempt a large command set, but at minimum get the Furbies to a) wake up on command, b) say something on command, and c) go to "party" mode on command. From the network side, you will be able to ping the Furbies. The Furby router will send UDP packets out to a specified address:port each time a Furby sends an IR packet. I'll provide a Perl client for the computer end. If there is enough time, maybe I could even wire up my singing Billy Bass wall plaque to the other serial port. My idea is to make a standalone WebCam (only thing required to watch is a browser) by attaching a camera, some RAM, an AD converter and maybe some logic to the evaluation board. I will also try to make it possible for remote control of the camera (turning and tilting the camera, and maybe turning on and off some lights), so that you can choose what you want to watch. The first goal is just to get the thing up and running without any compression (BMP), then I'll probably try some simple compression (GIF), I guess it is kind of hard to do JPG compression, but I'll have a look at it if there is enough time. A future version of this system could have some motion detection and a flashcard/harddrive to store images of events for later download, but that will not be done within this contest as it way too much work. Eric Smith (co-winner of the first SXList contest) has chosen to attempt an integration of his SERVID video character generator Virtual Peripheral with the SX Ethernet Stack. I personally doubt that this can be accomplished, but I hope I'm wrong!